UKIP: adding backbone to the party? 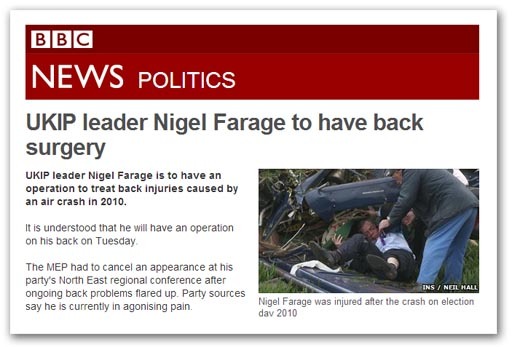 With Farage deciding to take time out for a bit of spinal reinforcement, he may not wish it to be generally known that the surgeon giving him a bit more backbone is of Indian immigrant stock. But giving backbone to his party is Yorkshireman Paul Sykes who is under the impression that giving UKIP a shed-load of money to help it top the polls in May is somehow going to help us get out of the European Union. His latest investment in the party is expected to run into several millions, as he declares: "It is time to tell the truth and let the people decide … I want this country to get back to becoming a self-governing nation", adding that, "That is what I am in it for. I am not going to sit here and do nothing. It’s my final thing this, it’s my Waterloo". UKIP needs to poll 27 percent in the euro elections if it is to overtake the Conservatives as the largest UK party in the European Parliament. With Syke's money, that is possibly more likely, although money alone has never been particularly effective in buying votes. Jimmy Goldsmith and his Referendum Party proved that. However, the money does get Sykes space in the Telegraph to air his views, on the back of commissioning a poll showing that 74 percent of the public are opposed to the free movement of labour from Romania and Bulgaria. Just 15 percent said they were in favour. "As a nation state, Britain is drinking in the last chance saloon", says Mr Sykes. "Our failure to exert any control over our border with the 27 other members of the EU means that we are on the brink of abolishing ourselves as an independent country and consigning 1,000 years of nationhood to the dustbin of history". He goes on to say that, "I have nothing against people from Romania and Bulgaria, but given the four million immigrants we have absorbed since 1997, and given the prospect that the end of transitional controls on two of the poorest countries on the continent will trigger another wave of mass immigration … you have to drawn the line somewhere". Sykes says he is not a UKUP member and had no party political motivation behind his decision to provide the party with funds. "I am in this to give people a say about their future", he says. "We are going to roll some guns out … every person in Britain will get to know a lot more from our campaign than they have ever got to know from all the other campaigns put together". Meanwhile, in Scotland, the UKIP campaign has already degenerated into a shambolic farce, with six of the candidates standing down as ballot papers were about to be sent out. Amid recriminations over infighting and a civil war between the UK party and its Scottish branch, Farage stands accused once again of parachuting in one of his cronies, and giving him an unfair advantage in the selection polls. No amount of Sykes money will protect the party from this type of dirty dealing, which has characterised the party selection process and led to some distinctly low-grade candidates representing the party. And in this case, one of the casualties is Lord Monckton, who withdrew in disgust from the list in September. Perhaps, though, it is best if Farage is off-line for a month or so, although even fortified with a little more backbone, it is unlikely he will improve the standing of those who would represent the party in the European elections. That would take more than even a surgeon of immigrant stock could manage.